*that's simply one of the perks. I have to say that a trip to ikea is not my favourite thing. While they do have some quite nice stuff I really hate traipsing through the warehouse surrounded by people who don't walk quickly. Usually by the time I've reached checkout I'm ready for a cup of tea and a wee lie-down. However a friend needed curtain advice, so Saturday was spent at ikea. 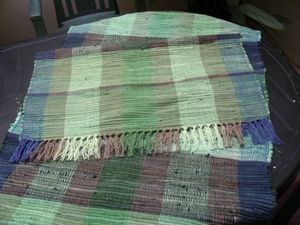 They're not my usual style, but there was something about them that made me so nostalgic for my childhood home (where, to the best of my recollection we didn't have rugs like that) that I had to buy them. And they'll look nice in the attic, which has an over-arching decorative theme of "green". We went to the movies last week to see Black Sheep, a New Zealand movie about killer zombie sheep. It was mostly hilarious - dragged a little in the third quarter but was overall well worth seeing. And it did make me quite homesick - thank god we'll be visiting New Zealand next month! Can't wait! 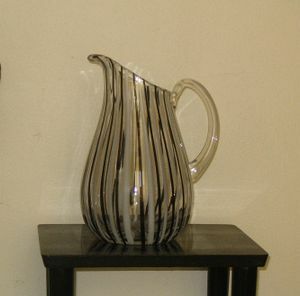 I'd seen it there a few weeks back, and I really need a new jug to replace the lovely green glass 50's jug that died in CatSmash '06 (our cat hates coloured glass - boy, is he ever in the wrong house!). And I couldn't stop thinking about this sleek little stripey number, and how nice it would look, so I went back and bought it. Sadly it really doesn't go with our mish-mash of other stuff - most of our stuff is quite old-fashioned, and works quite well as a sort of retro/vintage/shabby chic arrangement. But this lovely contemporary jug made everything else look shabby, rather than shabby chic. However I think Ke will like it, and it's much more in line with the sorts of things she has. And I'd been trying to think of a way to thank her for helping me out with my job-hunting stuff, so there, that's that sorted. Next week I'll go to That Vintage Shop and see if there's anything there. Bonus, another shopping trip.